Following the Animal Energy World Conference Linda Tucker and Jason A. Turner would like to share an important statement that clarifies the LTF’s position with regards to operations that offer human interaction with wild captive animals, particularly predators. We urge everyone to consider carefully where they visit when visiting South Africa and that we all continue to step into our purpose as true stewards and LionHearted Leaders in protection of the planet. Please share this Statement with your networks to help raise awareness about the diabolical cuddle-and-kill lion industry in South Africa and to help others avoid visiting or supporting the types of facilities mentioned in the statement. Following the 5th Animal Energy World Conference, with its magnificent expressed intention of helping restore Peace on Earth by bringing our natures back into service of Mother Nature, and which convened so many wonderful souls from around the world in a united effort to do so, we feel it is imperative to address a key question raised by so many delegates. In some cases, in a state of great distress, you asked about whether captive keeping of wild animals for human gain and exploitation should be viewed as acceptable today. The purpose of this statement is to make the position of the Global White Lion Protection Trust and the Linda Tucker Foundation unambiguously clear. As a leadership organisation, with a track record of pioneering achievements in lion conservation dating back 3 decades, we have a policy not to “name and shame” other people or organisations. That is not to say that entities committing atrocities against nature shouldn’t be named. They should. Our reason for not doing so is to redirect supporters from taking an outraged attitude of blaming others to taking positive action that focuses on solving the problem. For this same reason, to direct people to positive action, we are now obliged to point out that a captive animal tourist destination actively promoted by another presenter at the conference, is listed on a trusted “Black-List”. Our standard policy, urges people wanting to be part of the solution to support organisations that are doing genuine conservation work and boycott: 1. firstly, unethical airlines (those who carry lion trophies and lion body parts for commercial purposes) and 2. Secondly, unethical captive animal centers, especially those that are Black-Listed. This list has been compiled by a group of responsible conservationists. It gathers factual evidence from volunteers and informants, and “Black Lists” operations based on reliable information on malpractices, such as taking wild animals – including lions and leopards and their cubs – out of the wild and placing them in these captive tourist facilities; exploiting wild animals for human entertainment and commercial gain; and direct or indirect links to South Africa’s cuddle-and-kill industry. The Black List status is removed if those organizations can convincingly disprove the evidence. Although we were not present at this presentation, we understand that afterwards the presenter approached our stand on Sunday afternoon and challenged our organization for publishing this Black List. 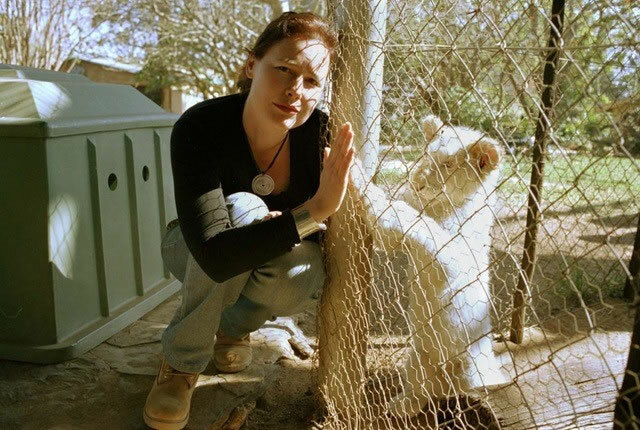 Julie Lines, Director of the Global White Lion Protection Trust and Linda Tucker Foundation explained that, as standard practice, we always refer volunteers wishing to support wildlife on their visits to South Africa to this list. We understand that the park referenced in the presentation has kept amongst its captive animals, White Lion cubs for “human enrichment”. So, let us say this, without ambiguity: In our united efforts to restore our right relationship with our planet, there is no excuse for exploiting animals, simply because current unjust law allows it. In our relationship with captive animals anywhere in the world, under no circumstances should we confuse humans enriching themselves at the expense of captive animals with humans maintaining they are “enriching” those animals. Animals in cuddle-and-kill camps in South Africa, as well as all captive zoological facilities worldwide, deserve our utmost love and respect for their service to humanity. None has given permission to be held in cages. As hostages, what they do NOT deserve is to be told they are getting “enriched” for their service to us. Our leadership role now as humans is to stop “taking” and start “care-taking”. And the most important way to do so is to take care we ensure the rights of freedom for all life. The time for exploitation of our Earth is over. Mother Nature is already in the process of reclaiming her planet. The Tsunamis and earthquakes are little tremors of the seriousness of her intention. Our role, if we truly love our animals and all of Mother Nature, as so many of our delegates at the Animal World Energy Conference sincerely do, is simply to get our true natures back into alignment with Mother Nature, not in self-service but in true service. Personally, we believe that each one of us, in our own unique, individualistic, authentic way can do so. In serving Mother Nature with the love and respect she deserves, we are seen and heard by her. And in so-doing, the efforts of each and every one of us counts. In a ruthless world which justifies human agendas above all else, we will always, to the best of our abilities, speak for the Lion. In South Africa today, with all that has been exposed through documentaries such as Blood Lions, and by numerous other organizations such as IFAW, CACH, Born Free Foundation, and Panthera, there is no excuse for ignorance, nor arrogance.